Prestigious Cliff area Estate with private beach stairs. This fabulous and beautifully landscaped compound includes a luxurious 5+ bedroom main house, 2+ bedroom guest house, 2 room studio over a 2 bay garage with dog wash, and private pool. 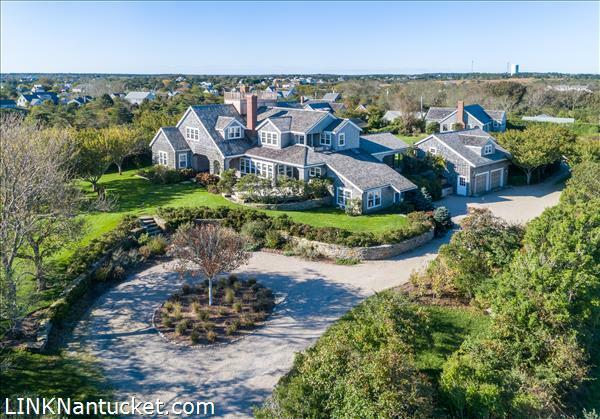 Spanning over 1.5 acres, this magnificent residence, graced by soaring ceilings and wall-to-wall windows, is well sited near Westmoor Club, Cliff and Brant Point beaches, and Town. First Floor The grand entryway with a sweeping staircase draws you into a voluminous layout made for entertaining. The great room with French doors to the expansive yard and side garden is the dramatic focal point of the main level, accompanied by a round sunroom with views of the garden, an elegant formal dining room, tremendous chef’s kitchen and sitting area with gas fireplace, home office, oversized guest suite, and tiled mudroom with custom dog door. Second Floor The second floor includes a master suite with walk in closet, laundry room and private deck. There are two additional guest suites each with private baths. Stairway to landing and comfortable access to roof walk with sweeping views from Tuckernuck to Great Point. Third Floor The widow’s walk is accessed via a staircase with a landing on the 3rd floor. Lower Level The lower level includes a bedroom room, full bath, spacious family room with cathedral ceilings and exterior access, and multiple storage rooms. Other Structures The detached 2 car garage has a dog washing station and 2 room studio with full bath and private deck. 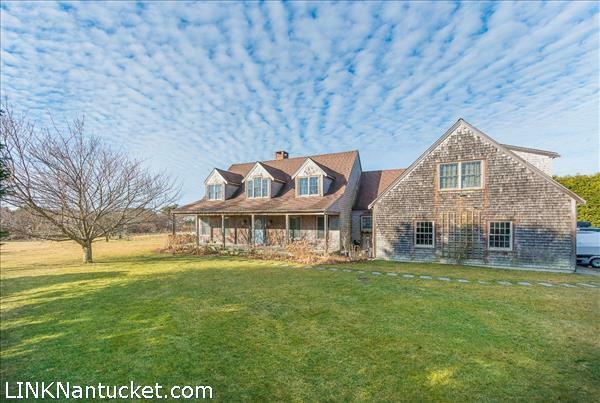 Close to town and private with an amazing pastoral scene that draws your eyes to the distant harbor views, this wonderful home is being sold by the original owners and is ready for its next steward. This home is a fun upside down home with an open plan on the second floor, with many windows that celebrate the magical views and incredible light. A terrific porch wraps around from the north to the west side of the house and frames the living and dining rooms. With 6 bedrooms there is enough room for everyone! Update the current interiors for a contemporary home or create a home to last the next 100 years. First Floor Just a few steps down from the front door, you are greeted and energized by the whimsically painted floors that set the fun energy for this house. There are 4 generously sized bedrooms, one that is ensuite with 3 rooms having direct access to the back porch. Two full baths are on this floor in addition to the en-suite. Laundry facilities and an owners closet round out the first floor. Central A/C on this floor only. Second Floor The home has a great open feel that mirrors the surrounding open land. One great room exists with three well-defined spaces; the dining room, living room and kitchen all having their own places. Two bedrooms on this floor flank the east and west side of the home. 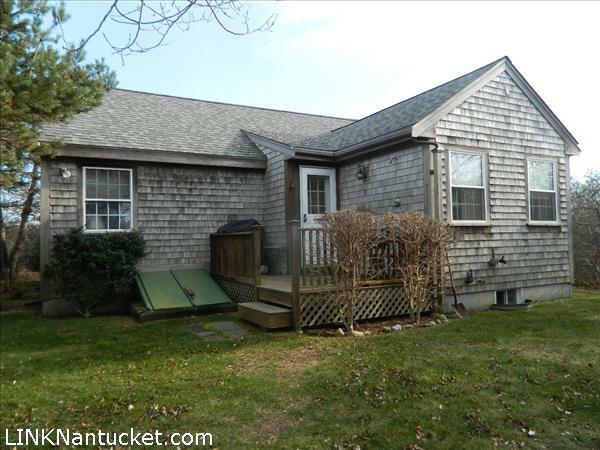 One bedroom is ensuite with french doors to the deck while the other bedroom has its own porch. There is a powder room off the dining/living room space. A commercial split system A/C on this floor. Third Floor A loft above the kitchen looks over the living room and could be used as a playroom, office or extra sleeping space when needed. Rare Offering! Two bedroom 1 1/2 bath cottage situated on a 1/2 acre private lot in Tom Nevers East. Open kitchen, dining, living area with cathedral ceilings. Two bedrooms (master with walk-in closet) each having access to full bath with stacked washer/dryer. Storage loft with ladder access. Cottage being sold fully furnished! Full basement thru new exterior bulkhead door. Built with 2″ x 6″ exterior walls. Oil hot water heat. 30 year architectural roof installed by Lydon Roofers in 2014. New basement windows installed in 2017. Close proximity to Wave shuttle stop on Milestone Road. 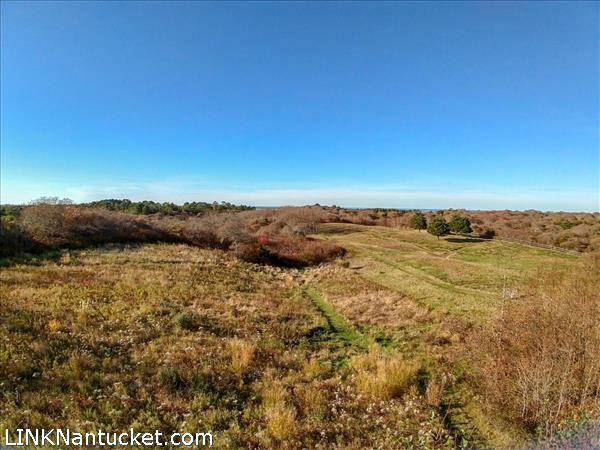 ***All interested parties should have Housing Nantucket Approval (Qualified Covenant Buyers) as well as having spoken to a lender for financing prior to viewing the property. 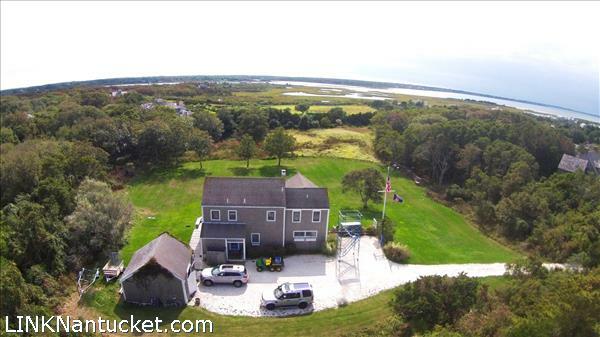 Property is owned by a licensed Massachusetts Real Estate Broker. Lower Level Full- Exterior access thru bulkhead door. 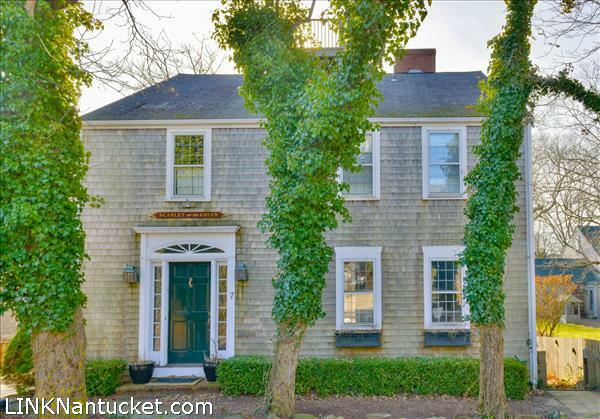 This charming home is located on a quiet lane just off Milk Street. Surrounded by history and shade trees, the house was designed as an antique, and was beautifully updated in 2016. Now, this formal home can claim a true gourmet kitchen, graceful formal living, an elegant dining room, and a sunny sitting room overlooking a deck and the rear yard. The second floor houses three spacious bedrooms, one of which is the master with en suite marble bath. This overlooks the private back yard and is warmed by the afternoon sun. The third floor is a spacious room with attached full bath and is large enough to allow a variety of bed options. Here, there is access to the roof walk. The basement is fully finished with comfortably high ceilings and has both interior on exterior access. There are three rooms, a full bath, bar area with sink, and abundant storage. In the private back yard, is a garden room with bedroom, sitting room, and half-bath. First Floor Lovely formal entry opens to the formal living room with fireplace and also to the formal dining room. To the left of the entry is a powder room. The formal living is spacious and sunny. At the rear of the home is a cozy sun room and newly remodeled gourmet kitchen. Counter tops are marble and include a large center island with seating. Appliances are top of the line Thermador and include a six burner + griddle gas range, and under counter refrigerated drawers in addition to the upright fridge. The sun room opens through french doors to a deck overlooking the back yard. Second Floor The large master suite looks out over the rear yard and has windows on three sides. The beautifully tiled master bath has a marble double vanity and marble walk-in shower. Two other spacious bedrooms occupy the two front corners of the home, and share a marble tiled bath. Third Floor Large attic bedroom with private Full Bath and access to the roof walk via a skylight. The space is not cramped, with the apex of the ceiling being over six feet. There is plenty of natural light, and enough room for various bed configurations. Lower Level The basement is fully finished with both interior and exterior access. Ceilings are comfortably high, and there is ample natural light. The space consists of a large living/sitting room, two smaller attached rooms, full bath, and bar area with sink. Additionally, there is a large amount of storage. Other Structures Separate garden room with bedroom, sitting area, and half bath – opens out to lawn and arbor. 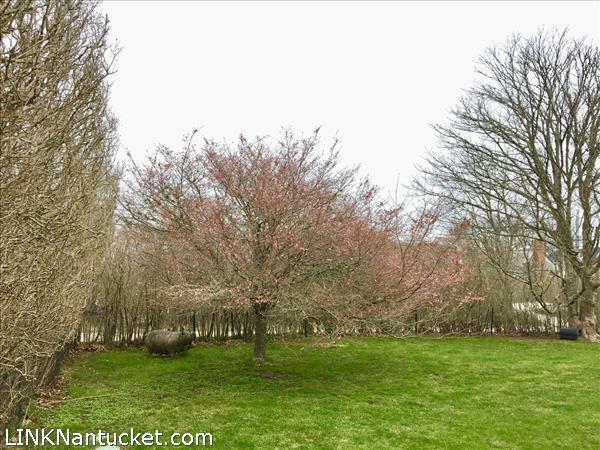 This is a nicely sized vaulted space and very pleasant in the summer months. Pocomo Retreat. Four bedroom beach house on a private, 3-acre lot offers easy access to Pocomo Point for swimming, kite surfing, boating, scalloping, and spectacular Pocomo sunsets. Second floor views of the harbor and creeks. Enjoy this simple beach house or go big with the HDC approved plans by Emeritus Development for House and Guest House. Close your eyes and imagine yourself in a private garden set back from the street in the old historic district. Then come to this delightful house and guest cottage moments from the heart of downtown to realize your dream. The four level, four bedroom main house set on a unique, oversized, in-town lot is a treat to behold. The separate one bedroom cottage offers flexibility for guests, an artists studio or an activity space…the options are endless. You must see this special property to fully appreciate how distinctive it is. Lower Level The fully finished and air conditioned basement is accessed both internally and externally. There is a central living area and a room presently serving as a guest room. A full bath and laundry are also located on this level. Highly desirable hedged corner lot. Close to Sconset’s center and The Siasconset Casino. Property allows for 30% ground cover in SR-1 zoning equal to 1,515 square feet. Buyer is responsible for connecting to town water and town sewer available on Bunker Hill Road. One public and two private golf courses nearby. Follow the long, private shell driveway to this exquisite property known as “Blackberry” (26 West Chester Street). Tucked back into the quiet of Lily Pond Conservancy, this home enjoys open vistas to the town’s many church steeples and has easy access to all that town has to offer. A seamless blend of both old and new construction, the home preserves the historic details of its original fireplaces and wide plank floors while boasting every modern amenity and impeccably designed interior finishes. Handcraft custom cabinetry and Rocky Mountain hardware throughout. The well executed floor plan offers just under 5000 sf of finished living spaces including an open living room and kitchen for entertaining and many intimate areas for privacy. The home has four stunning ensuite bedrooms, including a first and second floor master suite, as well as, built in bunks on the lower level and additional third floor space with full bathroom. There is a covered outdoor porch and a large, south facing yard with easy access to Lily Pond. This is an exceptional property and rare opportunity to purchase one of the most beautifully renovated, professionally designed and privately located homes in town. First Floor Enter through covered porch to foyer and powder room. Formal dining room with fireplace. This space opens to spacious living room, informal dining and kitchen. The kitchen features a large silestone waterfall center island and state of the art appliances with convenient access to mud room/laundry and outdoor shower space. French doors access a large covered porch with ceiling fan and built-in speakers. Nicely separated first floor master bedroom ensuite with fireplace. Wired speaker system throughout first floor. Second Floor Second floor sitting area/tv room with fireplace. Additional stack laundry for second floor convenient to bedrooms. Master suite with private south facing terrace, dramatic dual vanity shower/tub and numerous built-ins and walk-in closet. Two additional ensuite bedrooms. Third Floor Third floor has additional large room and full bath. Lower Level Lower level finished with two built-in bunks and family living space additional walk-in basement for storage. This dual residence offers a three-bedroom main house and a one-bedroom apartment in the front of the building. Surrounded by lush landscaping and a sprawling yard, this property offers ample space, privacy and is the beneficiary of an additional half acre of property by easement. Two driveways allow for multiple vehicles, boat storage or trailer space. 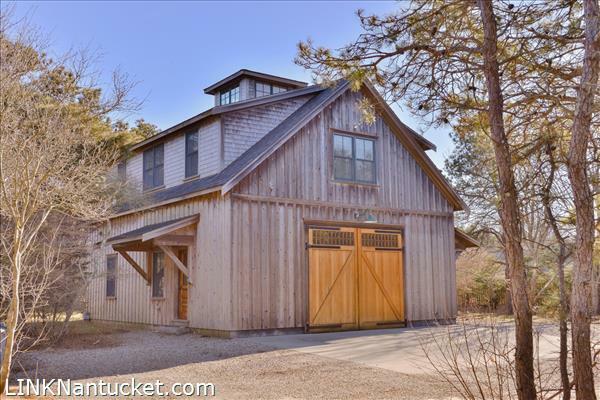 Both residences share a large garage with heated floors, which is perfect for extra storage in the off season. The one bedroom apartment offers versatility, either as an in-law suite or as rental space. A separate entrance in front of the home makes coming and going a breeze for prospective tenants, while a side entrance is ideal for shared living. Lower Level The full basement is partially finished with a full bath that offers ample opportunities for any family. There is also separate access to the backyard from this level. This Surfside location is an ideal setting to build your island dream home. 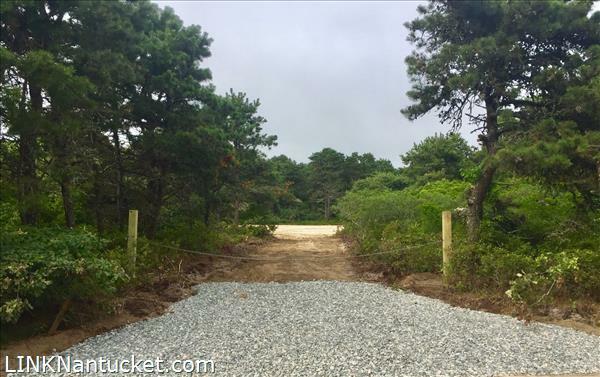 The private, one acre lot, is In close proximity to popular Surfside beaches and town. The builder friendly parcel can accommodate a large home, cottage. pool and pool cabana with 2800 sq ft footprint and up to 6 bedrooms. This beautiful home is nestled on a quiet street and surrounded by lush landscaping for maximum privacy. Just moments from Town and the Cliff bike path, this is a prime location for those that desire access to downtown with the ease of out-of-town living. The property has been beautifully maintained and offers ample natural light, cathedral ceilings and seamless indoor/outdoor living. First Floor From the front entrance enter through a spacious foyer with a beautiful sitting room to the right. This room features a wood burning fireplace, cathedral ceilings and access to the side patio. Straight ahead is a top-of-the-line kitchen complete with a breakfast bar, small seating area and access to the side patio as well. From the kitchen, an open sitting room and dining room offer front and back views of the property and access to the back patio. The en suite master bedroom is also located on this level with cathedral ceilings and a ships ladder to an oversized loft, which is perfect for additional storage space or as a home office. Second Floor The second floor features three bedrooms. Two queen bedrooms share a hall bath with laundry facilities and the third has a queen bed and an en suite bath. Lower Level The finished basement offers laundry facilities and plenty of storage space. Four separate contiguous lots that together are over 1 acre in a convenient central location across from the new Police and Fire stations. 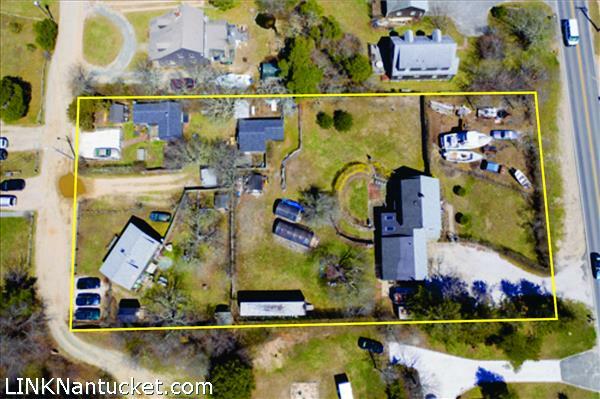 Property contains four separate dwellings and four additional structures with off street parking for all parcels with access from Fairgrounds Road and Lewis court . Property being sold as is. 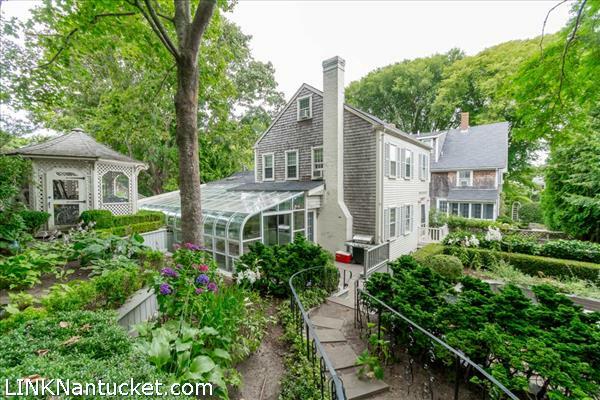 A newly renovated contemporary, five bedroom home with multiple living spaces is located in the heart of ‘Sconset village. 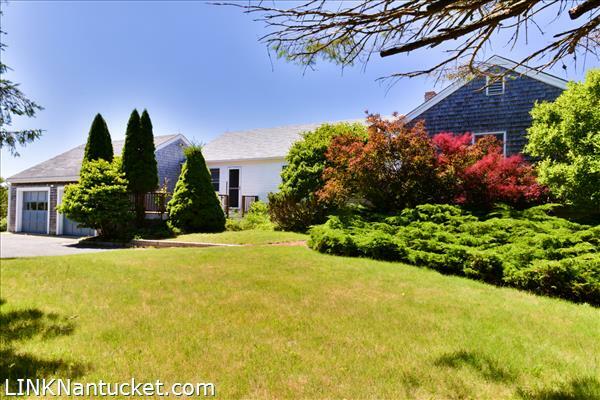 This home is located on a quiet shelled street just minutes from the Sconset Casino, Sconset Market and the Chanticleer. The property is attractively landscaped with mature hedges and perennial gardens. There is a wonderful back porch, great for entertaining. 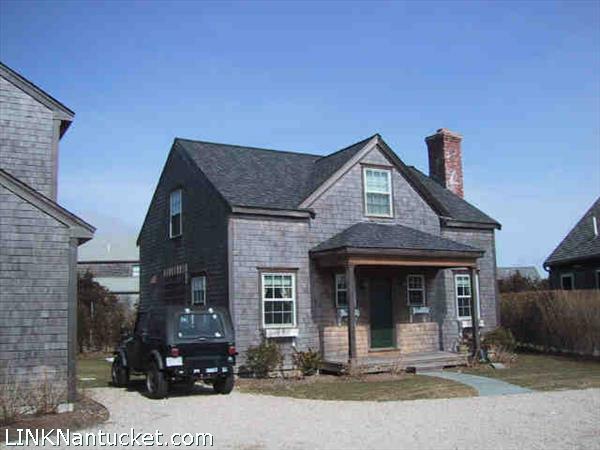 There is an attached one car garage, custom built shed and off-street parking for 3 to 4 cars. First Floor Entering through the front door, there is a living room with gas fireplace and French doors which lead from the living room to the covered back porch. The newly renovated kitchen has a center island and is open to the dining room. State of the art appliances include a wine cooler and additional built-in refrigerator drawers. Beyond the dining area is a powder room and another set of French doors leading to the back porch. A bright, light filled family room has access to the back deck as well as a built in office space. To the left of the kitchen is an updated laundry room which leads to a separate in-law guest wing or nanny’s quarters. This wing has private access to the front yard, a small den and 2 bedrooms – a walk through queen bedroom and a bedroom with built-in twin beds. This room is equipped with built-in coffee bar, mini fridge, 2 burner stovetop and a full bath. A master suite is located off the living/dining area with French doors leading to the back porch with custom built-ins. Included in the master suite is a private dressing room leading to the master bath with spa/steam shower and separate soaking tub. New wood floors throughout. State of the art AV system with Sonos speakers throughout the house including sound bars, televisions and speakers. Second Floor Stairs up to the second floor open up to a landing. Two newly renovated bedrooms, one with a full bath. One of the bedrooms has a private balcony looking over the backyard. Other Structures Attached one car garage. A 12×14 foot shed. Moments to Town and the Westmoor Club this property boasts a wonderfully cared for turnkey 5 plus bedroom main house, pool, two story pool house with full bath, half bath, wet bar with full size refrigerator and sitting areas. Well landscaped outdoor living spaces flow seamlessly around the pool, decks and covered porch areas. This property is a must see for anyone seeking close to Town with pool opportunity that sleeps like a 6 bedroom compound. First Floor From the white shell drive on a private lane just off West Chester street the covered porch side entrance hall leads into the bricked mudroom hall. Off this hall find large laundry utility room. Entrance to the secondary living area, that has a full bath (s), private access to the pool area as well as full set of interior stairs to a private second floor bedroom. Entry hall opens to the heart of the home, large kitchen, dining and family room areas. Raised counter height center island in the kitchen has room for numerous family and friends , this space acts focal point for this great entertaining space. Adjacent to the kitchen sliders to rear deck that include fire pit and pool area (pool has auto cover) complete indoor outdoor access for full summer living effect. Dining area just off kitchen, opens to a larger living room with gas fireplace, coffered ceilings and raised paneling. The first floor is complete with bedroom, full bath (s) and a separate half bath. Second Floor Second floor hosts 2 generous guest suites that share a full bath, and a large master suite. The master suite is complete with vaulted ceilings, large 5 fixture bath, steam shower, and generous closets. Lower Level Poured concrete crawl space. Other Structures Pool House. This thoughtfully designed secondary structure serves many purposes. Side entrance from drive area opens to living space with tile floors, hvac, half bath and barn doors to the driveway, this area opens to wetbar with full size refrigerator, sliders to bluestone covered porch surrounding the pool and spa areas. Stairs lead to second floor sleeping loft complete full bath (s), and its own hvac controls. 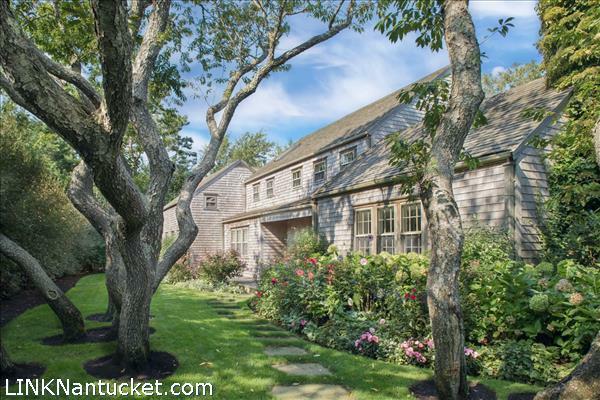 This thoughtful building serves many needs for an active Nantucket lifestyle. 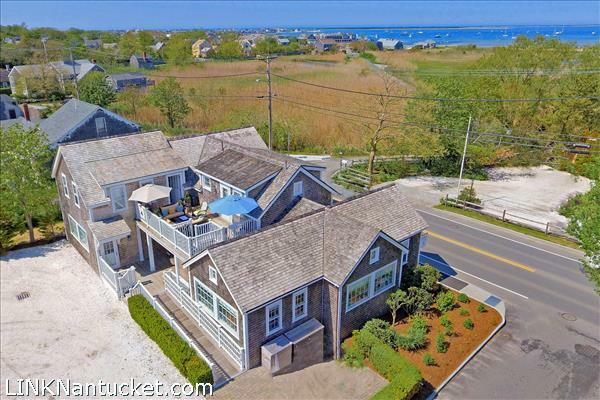 Classic Nantucket Beach house with 5-bedrooms, 3.5-baths nestled in the dunes with stunning views from the second floor over Nantucket Sound, Harbor and beyond! There are multi-tiered porches and decks that take full advantage of the serene surroundings, as well as wooden walkway over the dunes to private beach stairs. This home sits directly across from the beautiful 156-acre Linda Loring Nature Foundation property. The ‘beach nourishment and bank stabilization project’ is set to be completed in May 2019. First Floor Enter from front porch into a den with doors out the back side to another porch. Four bedrooms on this level share two full bathrooms. Second Floor Kitchen, formal dining room with amazing views, living room with brick fireplace and 2 sets of slider out to an upper deck over looking the water. An additional set of sliders lead out to another upper deck facing the front side of the property overlooking conservation lands. Master ensuite bedroom includes an office with door out to front upper deck. There is also a powder room on this level off the kitchen and a laundry closet. 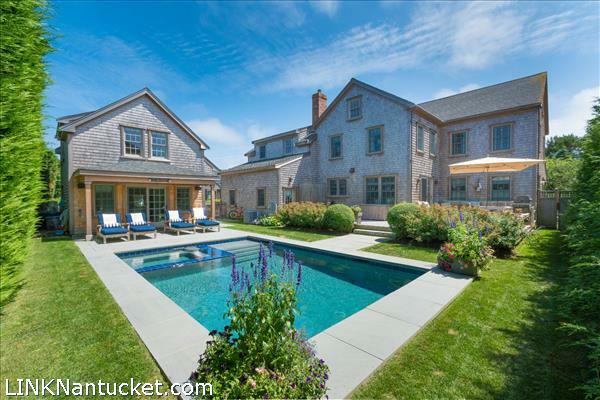 “SUMMER HAUS” is the ultimate NANTUCKET RETREAT! 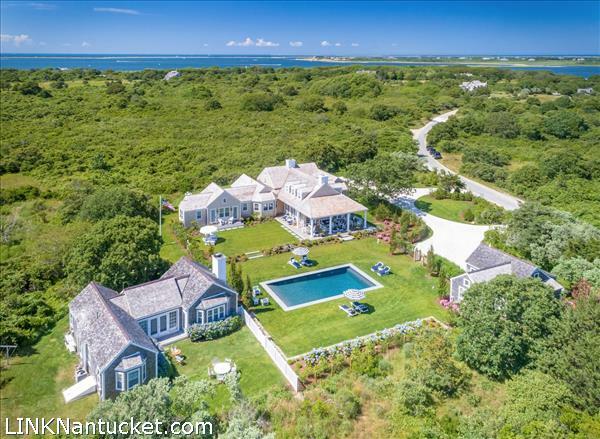 This spectacular 4 acre compound, with deeded harbor access, combines peace and privacy with modern amenities, design and dramatic details! 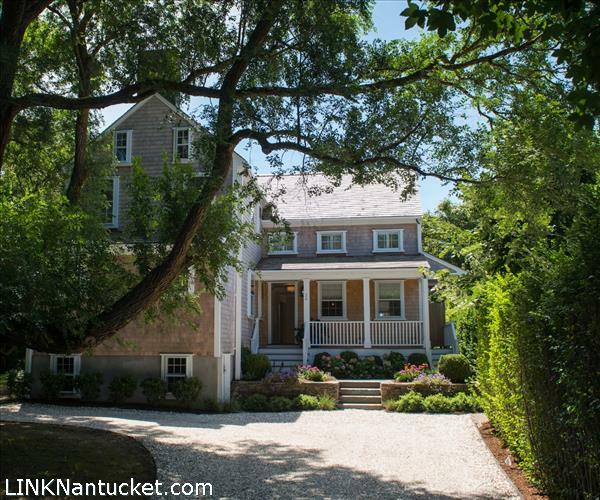 The property is ideally located just minutes from Town, moments from the beach and down the street from West Polpis Harbor, allowing a quick return to your exquisite home for a relaxing afternoon swim. The striking interiors and grand entrance cascades into the 24′ X 24′ ‘Great Room’ with a fireplace, 20 1/2 foot cathedral ceiling and is surrounded by 8 sets of French doors allowing for panoramic views of this extraordinary property, gardens and the new 20’ x 40’ Gunite saltwater pool! This is a perfect, spacious room to enjoy summer family gatherings which overflow to the many covered porches and decks with several dining and sitting areas, as well as overlooking the views of the ever changing colors in the fall! Renovated and masterfully executed by the team of Botticelli and Pohl and Levesque Builders, the beautifully appointed and elegant main house offers many custom details which include Ralph Lauren furnishings and fixtures as well as decorated by the renowned Stiles Colwill. There is a first class, deluxe “Chef’s Kitchen” with easy access to the incredibly chic “Hermes Orange” lacquered bar and open dining area which is ideal for hosting intimate dinners as well as large family gatherings. The first floor also includes a spacious and sophisticated first floor master suite that has all the privacy of its own wing. NEWLY RENOVATED LOWER LEVEL WITH A DOUBLE SET OF TWIN BEDS, DAY BED WITH TRUNDLE, ENSUITE BATH WITH TILED SHOWER, DOUBLE SINK VANITY, WALK-IN CLOSET AND A BRIGHT, SPACIOUS GAME ROOM! 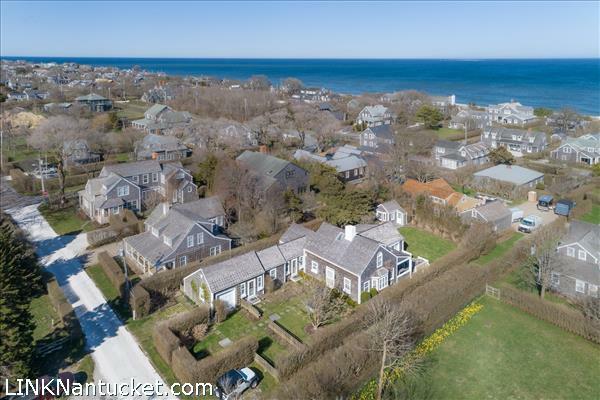 If you are looking for the ultimate Nantucket island oasis, look no further as there is no better place to enjoy warm summer nights, cool breezes and all that Nantucket has to offer! First Floor Privacy and elegance are the perfect combination at this chic & relaxing summer retreat in a pastoral setting. Through the front entry way is an open living space with coffered ceilings and a custom stenciled floor which cascades into a large and open living room with three sides of french doors for panoramic views of this spectacular property. Fireplace with custom mantel and easy access from all sides of this room that lead out to the covered back patio and porches for private outdoor entertaining, dining and to the pool and expansive yard. A beautiful ‘Hermes” orange lacquered full bar to the left of the front entrance which is ideal for entertaining large or small groups alike, bar includes a sink and Sub Zero wine refrigerator. Further on is a new and complete deluxe ‘Chef’s Kitchen’ with a marble center island and countertops; Top of the line appliances that includes a Wolf Double Oven, Sub Zero refrigerator, extra freezer and refrigerator drawers and a small Sub Zero drinks refrigerator; open dining room with custom wallpaper and expansive views of the property; mudroom with built -in storage and bench seating, desk area and outdoor access to parking area and front yard. A custom floor stencil of the Nantucket Island leads into the deep cobalt blue lacquered private den/library with gas fireplace and built-in book shelves. This sophisticated and timeless room flows into the spacious master suite with pocket doors, ensuite bath with large clawfoot bathtub, double vanity and spacious tiled shower and access to the side deck towards the front yard and pool; built-in shelves and drawers, washer, dryer (Miele), built- in hamper, owner’s closet and a glorious walk- in spacious closet. Guest Bedroom with ensuite bath with tiled shower and views of the expansive property to the north. Hall powder room with pocket door and custom wallpaper. First level also offers a new sound system throughout. Second Floor Open and airy Guest Bedroom suite with ensuite bath with separate tub and shower, two walk-in closets and views to the west of the property – perfect for sunsets! Lower Level Lower Level: Separate laundry room with sink storage; Whirlpool washer and dryer. Sitting area with tv and built-in bookshelves- perfect for movie night!. Butler’s pantry with plenty of storage and second Sub Zero refrigerator. Storage and wine room. NEWLY RENOVATED private wing with game room (ping pong table), walk-in closet, double set of bunk beds, day bed with trundle, ensuite bath with tiled shower and a double sink vanity. This area accommodates 6 for sleeping – a perfect space for overflow family! Other Structures Studio with small refrigerator, daybeds, and a full bath. This is ideal for an office or artist’s studio.